Ebola treatment centers are facilities that plan to care for and manage a patient with confirmed EVD for the duration of the patient’s illness. State and local decisions to designate Ebola treatment centers are informed by the results of a CDC site visit conducted by an interdisciplinary team of subject matter experts. Site visits assess the hospitals’ ability to meet the minimum criteria (including infection control capacity, physical infrastructure, staffing resources, PPE supplies, waste management processes, worker safety training, environmental services, and laboratory set up). Staff must be trained in and have practiced putting on and taking off (donning and doffing) PPE for Ebola, as well as providing clinical care using PPE. Given current PPE shortages, Ebola treatment centers may not be able to procure in advance the amount of PPE needed to care for a patient with EVD. Therefore, at a minimum, to be ready to accept and care for patients with EVD, hospitals will need sufficient PPE for at least 7 days. If hospitalization is anticipated to exceed 7 days, state and local health authorities, in collaboration with CDC, may provide or facilitate the procurement of additional PPE supplies. CDC Ebola Response Teams (CERTs) are ready to deploy to any Ebola treatment center to provide technical assistance for infection control procedures, clinical care, and logistics of managing patients with EVD as soon as the health department or hospital requests assistance. In addition, CDC is available 24/7 for consultation to hospitals and state and local health departments by calling the CDC Emergency Operations Center (EOC) at 770-488-7100 or via email at eocreport@cdc.gov. 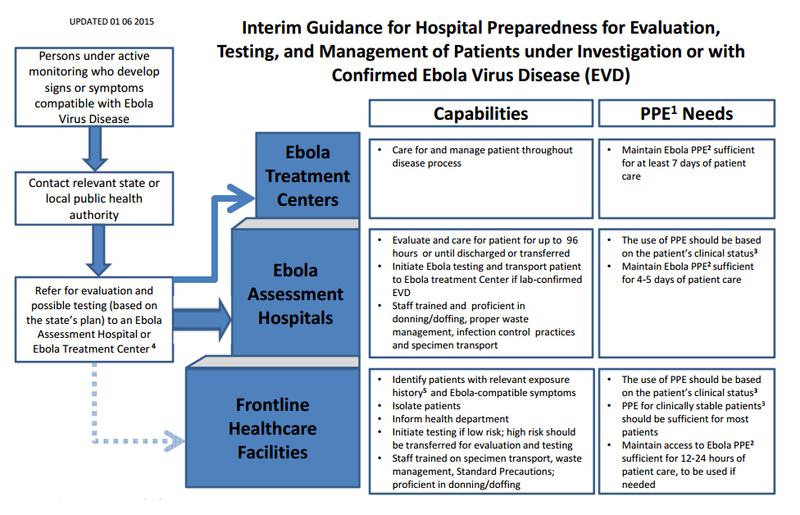 Guidance for Ebola Treatment Centers can be found at http://www.cdc.gov/vhf/ebola/hcp/preparing-ebola-treatment-centers.html.